Listening to the radio on St. George's Day (last Monday in case you missed it) we heard various proposals for a national anthem for England, something that could be sung at Twickenham to counter the emotion of "Hen Wlad Fy Nhadau" or played at the unveiling of a putative English Parliament. This set us wondering if, given the prominence of London in international affairs and the prospect of the 2012 Olympics in particular, our capital ought not to have an anthem of its own, something to which all Londoners could rally, hand on heart, during summer breakdowns in deep tube tunnels or at the grand opening of the next cloud-bothering tower block on our majestic skyline. BBC London has already launched its own competition for their viewers and listeners to write a suitable song, but, in common with many of the radio pundits, we can't help thinking that the public are far more likely to get behind a tune they already know and love than they are to try to assimilate a completely new composition. After all, it's the ancient flag of St. George that is now draped ubiquitously whenever an English sports team shows any sign of hope whatsoever, rather than a new alternative from a hip and trendy designer. With this in mind, Londonist is setting before our readers the task of selecting an anthem for London from amongst the many popular numbers that feature our beloved town. Initially, we wracked our brains to recall all those great songs, but after "London Calling" inspiration tailed off quickly and so we were relieved to discover that Wikipedia was already well ahead of us (though we note in passing that they have yet to add "Scene from a London Flat" from Maestoso's 2005 album, "Grim"). This list was a veritable embarassment of riches considering that the whole raison d'etre of our search was that the songs had to be well-known, so, scanning through the list we stopped and wrote down every title that made us say "Oh, yeah! Of course!" out loud. Our stated aim was to find something for communal singing so we removed anything that wasn't really, well, suitably anthemic. If it was at least a bit cheerful that also helped, though that's not essential as can be seen in our friends north of the border somehow getting by on the noble dirge that is "Flower of Scotland". There's also no compulsion that we have to sing all of it, which is why the stuff about confounding knavish tricks rarely gets an outing in front of Queen Lizzie. Now we know our readership to have a collectively strong will that prefers, admirably, to make its own decisions, and so we offer you the chance to nominate songs to be included in our final list. Simply leave a comment to this post, or send us an email, telling us which song we should add to our list and why. The most worthy nominations (and, in all likelihood, those with the healthiest statistical backing) will be featured amongst those that go forward for the formal vote which will be opened in the middle of next week. The gauntlet is thrown down and your city needs you. Let the debate begin! 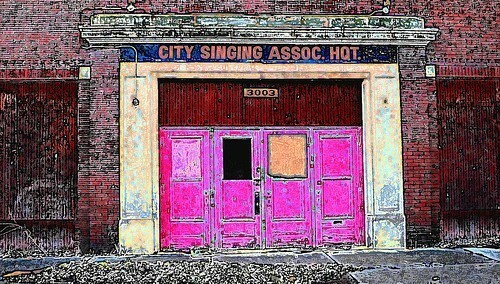 Splendid colourised picture of the abandoned City Singing Association Headquarters in Detroit via tEdGuY49®'s Flickr stream.